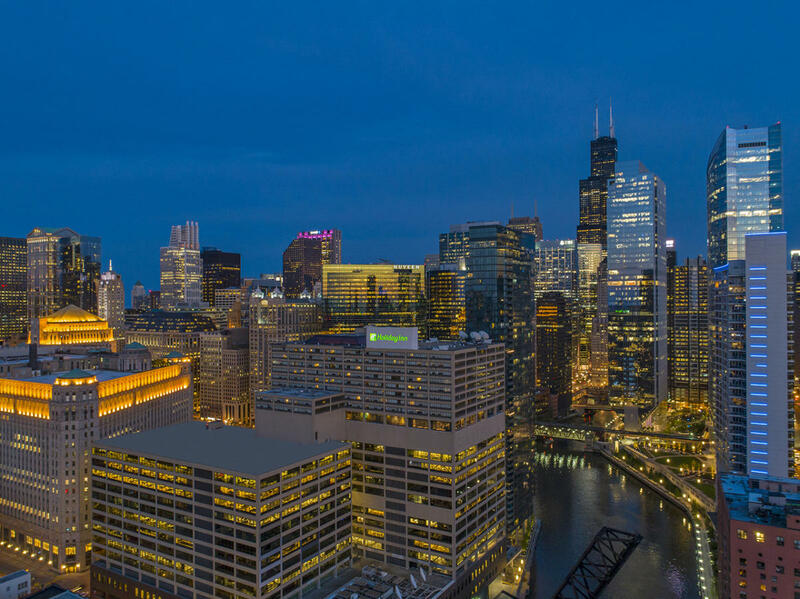 Located in downtown Chicago’s exciting River North, the Holiday Inn Chicago Mart Plaza River North overlooks the Chicago River and showcases iconic views of the cityscape in every direction. Defined by urban style and modern comfort, the recent property redesign sets the stage for an exciting Chicago experience for both business & leisure travelers. Ideally situated across from the Riverwalk, near the Magnificent Mile, Navy Pier and Millennium Park, the Holiday Inn Chicago Mart Plaza River North is the perfect base from which to explore Chicago. Catch a rising star in the nearby Theatre District, walk to award-winning dining or watch the sunset from the Willis Tower before retiring to your guest room featuring breathtaking views of Chicago. Business travelers will appreciate the skybridge linking the hotel to theMart, Merchandise Mart ‘L’ stop and walking distance to the Loop, Financial and Business district. The hotel offers 15 meeting rooms with 25,000 sq. ft. of function space and accommodates up to 800 guests for a trade show or reception. Located only three miles from McCormick Place Convention Center and an easy transfer by ‘L’ or Uber can also take guests to Wrigley Field, Guaranteed Rate Park or O'Hare and Midway Airports. Named a Top 100 Workplace in Chicago by The Chicago Tribune since 2014, we invite you to experience the legendary service of our exceptional staff.